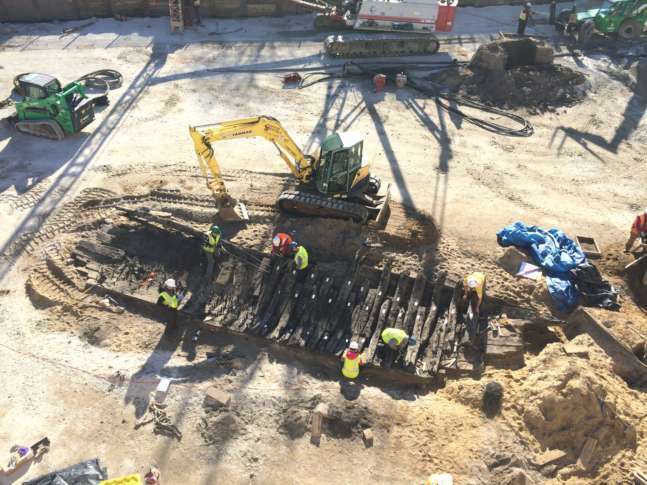 WASHINGTON — New information has been uncovered about an 18th-century ship discovered in 2015 along the Alexandria waterfront at South Union and Duke streets. Archaeologists have since unearthed the 50-foot ship. They still do not know what it was used for, but they do now know how old it is and where it is from. “The trees that were used to build the ship were chopped down sometime after 1741,” said Benjamin Skolnik, a City of Alexandria archaeologist. The scientists were also able to tell that the trees were from Boston. “Because weather is different from one place to another, the dendrochronologist were able to match the wood in our sample to several sequences that come out of Boston,” Skolnik said. The width of tree rings is depended on a whole host of climatic variables; rainfall, temperature, sunlight and wind can affect the growth of a tree and it affects the width of tree rings. “From year to year those variables change and you are left with the unique pattern of thick and thin tree rings,” he said. Skolnik said some of the earliest tree rings from the ship are from 1603 — four years before John Smith showed up in Jamestown and 17 years before the Pilgrims showed up in Massachusetts. “So the wood in the ship comes from a time of early American history that even predates the earliest permanent English settlements here in the New World,” he said. But the ship was sunk on purpose by early Alexandrians. He said documentary records show between 1788 and 1796, the ship went from being a vessel to being buried. “Here in Alexandria I do a lot of historic map work, and we have a plat from 1788 that shows the ship, the location — where we found the ship is still in the river,” he said. Skolnik said there is another map showing that the town actually extended outward into the river about a decade later. Early colonists would fill in the river as a way to extend the city. “The early colonists banked out. They cut down into the bluff that was along the river bank, filled into the river. Actually extended eastward into the Potomac River,” he said. He said this so-called “wharfing” or “banking” was a fairly common practice along port towns such as New York, Boston and San Francisco back then. At the time, a good chunk of lower King Street in Old Town did not exist, and Lee Street used to be called Water Street because that was how far the river used to come up, Skolnik said. Right now, the ship is stabilized sitting in tanks of water. At some point, it will be sent to professional conservationists. But Skolnik said there will be a bon voyage event where the public will be invited to see the ship before it is sent off. Skolnik said they also recovered a bulk head or a wharf that the ship was parked up next to down on the site. The dendrochronology dates show that the trees to make the wharf were chopped down in the winter of 1773-1774. That corresponds to a known period of wharf building on Alexandria’s waterfront. He said Thunderbird Archaeology, a division of Wetland Studies and Solution, Inc., did a lot of the physical work to dig up and recover the ship. It also recorded crucial data from the recovery site. He said the Oxford Tree-Ring Laboratory was instrumental in determining the ship’s age.